In the analysis the long-term changes were identified and the potential impact on the provincial area was defined (understanding the system). In the second phase the acceptability of risks was discussed and the spatial claims (quantitative) were defined (measurable input in 'tame' planning system). In the final phase the strategic interventions with the capacity to increase resilience, were described. In order to understand the existing system and explore the way turbulence causing factors like climate change and energy-supply function a method of mapping the potentials was developed (Dobbelsteen et al., 2007). This mapping method was used for energy as well as for climate potentials. The key-factors, which are crucial for spatial planning were defined for climate change as well as for energy and put subsequently on maps. The climate change factors, which are of special importance for the Groningen situation, are the future changes in precipitation and the possible sea level rise scenarios. The energy potentials focus on the potential energy production from renewable resources. Therefore, solar, wind, geothermal, hydro and biomass potentials are mapped. The next step in the planning process was the transition of the knowledge about the regional climate and energy system into interventions and ideas, which might improve the resilience of the region. Two ways were explored. The first way aimed at integrating the potential maps into a climate proof map of Groningen: the idea map. This map shows an end-image of a climate proof province. It can be seen as a desired future on the long term and does not give insights in the way this future might be reached. The map functioned as a source for debate and gave direction to the planning process. The second way focused on the definition of strategic interventions, which should be introduced today in order to start the change of the region towards higher resilience. These strategic interventions imply and stimulate the desired changes on the long term. These interventions can be seen as the first steps towards realisation of a climate proof province. The second way to improve the preparation for turbulent environments is to place strategic interventions (Roggema, 2009). These interventions are not meant to define exactly an end state of the area, but they mark the start of processes, which emerge from that point on by themselves and influence a larger area. The impact of the intervention may be predicted and needs to generate more resilience in the area, but the exact future developments in the area are not defined. This approach makes it possible for stakeholders, involved parties and citizens to co-operate and contribute to the development of the area. The objective of this approach is to increase resilience in the entire province. This is realised by loosening the fixed state of the existing situation. In most of the situations this fixed status is the cause of large risks. By introducing the flexibility to deal with future threats or challenges and creating the space for the impact of these threats and developments, society is better prepared and already used to the situation and possible events, which occur in the future. The windows of Groningen (Fig. 8.12) show several of these opportunities, where loosening the tight and normative rules enable the area to react proactively, increase preparedness and are able to return to their original state after a change more easily: improved resilience. These strategic interventions are the impulses, which are added to the area and adjusting the area without changing its function. The impulses make use of the capacity the complex adaptive spatial system has (if enough space can be created to do so) to adjust itself to new circumstances and developments. The interventions function like the simple impulses, which are capable of reshaping a swarm of birds: constantly transforming, but staying the same swarm of birds. In the Groningen case several of these interventions are proposed. They have in common that a single intervention opens the way to an indirect effect in a larger area. 6. The introduction of a new railroad, which connects the City of Groningen with the Peat Colonies, enables the southern part of the province to develop a robust ecological corridor, which gives space to shifting ecological habitats and makes an interesting living area possible amidst nature. A couple of these interventions are described in more detail. The first example of a strategic intervention is dealing with the rising sea level and the upcoming shortage of drinking water (Meliefste et al., 2008). In the design fresh water will be stored in the Lauwers Lake (Fig. 8.13) by heightening the level of the water in the Lake. This higher water level makes it possible to keep up with the risen sea level and the water board is still able to let water flow into the sea without pumping. As a result of the risen water level the entire water system (the swarm) of Groningen is forced to adjust itself. The risen water level in Lauwers Lake also implies the rise of water level in the Reitdiep stream and other small canals and brooks. The capacity to store rainwater is increased by this simple intervention, which helps to deal with heavy rain showers and potential flooding in villages and towns. In other words, by solving the first problem and intervene in the Lauwers Lake, the entire region is challenged to adapt effectively to the effects of climate change. most vulnerable part near the Eems harbour (Meliefste et al., 2008). The kwelder-works start natural processes, which fixate sand and mud. These processes enable the soil to slowly grow along with the rising sea level until it finally rises above the sea level. Because of this, the kwelderworks are capable of protecting the shore. The offensive way the kwelderworks near the Eems harbour are positioned creates extra space. This newly created land (the swarm) is not meant for a specific purpose. This choice can be made at a later stage. When new arable land is needed it is possible to turn the area into agriculture, but when the economic development of the Eems harbour requires expansion of industrial area it is also possible. And when the ecological quality of the Wadden Sea requires extra space, it may be realised on this location as well. 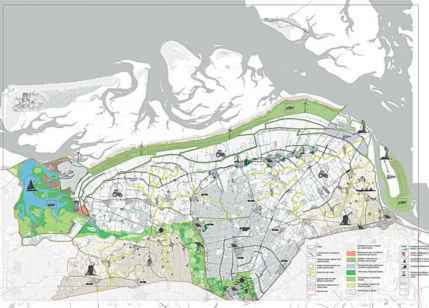 The introduction of the kwelderworks implies a better protection of the coast and makes it possible to postpone the choice what to do with the reclaimed land until it is needed. intervention resulted in the upgrading of the entire area (the swarm) around the village, where economic development improved, the amount and quality of amenities increased, the infrastructure is improved, the possibilities to deal with large amounts of water is increased and unemployment is decreased. The indirect development of the area evolves by itself, after the impulse of the Blauwe Stad has been done. 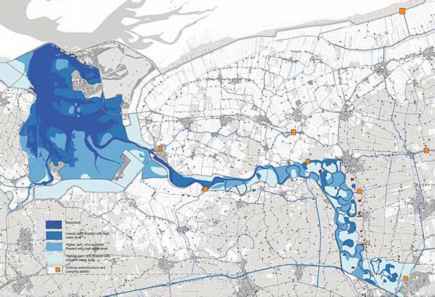 The coastline between Eems harbour and Delfzijl is the most vulnerable in the province. In the hinterland a second dike supports almost every dike piece in the province. This second dike is absent in this area. A breakthrough here causes a flood that would reach the province capital within 24 h. The economic damage is largest if this breakthrough happens. This strategic intervention consists of the perforation of the existing sea dike and the creation of an extra dike in the hinterland (Fig. 8.16). The area between the old and new dike will be flooded semi-permanent. 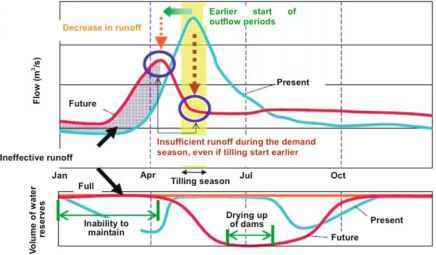 In this area dynamic circumstances emerge, both from an ecological point of view (brackish, changing water levels) as from a human perspective (living on newly built wierden (artificial hills), changes in wet and dry surroundings). Society will have the chance to adapt to future threats, like a flood, because the area is designed for it. After water enters the area, it leaves and the area can turn back into its old position very easily. Moreover, in the future it might be difficult to define what the original state of the area was, covered with water or not? The existing spatial planning system has difficulties creating those effective interventions, which are capable of dealing with increasing turbulent circumstances (like the uncertainty of energy supply and rising energy prices and changes in climate). These aspects are turbulent because they are long-term, uncertain and play a role in the far future. In traditional terms: they cannot be planned, but will occur as surprises. It is possible to deal with these uncertainties and create resilient areas if areas are given the opportunity and space to change along with sudden changes and at the same time build experience today which is required for future threats and challenges. If the area is given this opportunity the resilience will be improved. The area will be capable of dealing with the effects, threats and challenges these future changes imply. When the area is given the possibility to change with the changes, the spatial order is not fixed in a certain state, but the spatial system is designed in a way that it is capable to change its patterns, its 'being' and the way it looks according to the requirements of that date or the changing, unexpected demands of the future. In the current 'fixed' spatial planning system almost no spatial flexibility is included. Because of that there is just no space available to create a buffer to adapt to fast changing circumstances more easily and to increase preparedness. The planning system of the future has to include steering principles, which enable areas to adapt more easily and change its spatial patterns as required by future threats and challenges. These steering principles include, according to the Groningen example two elements: space to change and strategic interventions. These elements differ from place to place, depending on the characteristics of the natural system and spatial identity. Thus, the swarm in the area can be steered in a desired direction of higher resilience. Depending on the specific qualities of the area the spatial regime can be distinguished. The combination of spatial and natural character of the system in combination with a well-defined intervention creates the resilience regime for that area. 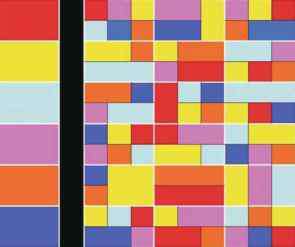 In abstract terms, a 'Mondrian' typology can be derived (Fig. 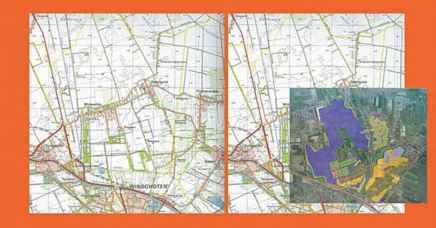 8.17) as in the concept Atlas Groningen is developed (Roggema and Huyink, 2007). Evaluating the Groningen case several remarks can be made. The development and usage of innovative methods as well as the applicability in practice will be discussed. function as a layer to base policies and designs on. Taken the potential maps as a base design interventions or measures can be found. The final way they can be used is as an inspiration for integration. The maps offer information which was not available in earlier planning processes. The constructed idea-map for an adaptive Groningen functioned as a trigger for debate. 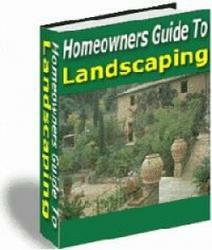 However, the question may be posed if the content of the map is too integrated and coherent. It seems that the idea-map is more or less the same as an end image of a future Groningen, but then an adaptive one. The idea-map is an interesting starter for discussion, but it contains the risk of stepping into the same pitfalls as the existing planning practice: a far to fixed image of the future is translated into strict spatial measures, while the future becomes increasingly unpredictable. The definition of strategic interventions in combination with the creation of flexible space in the area in order to give space to unpredicted developments can be an approach, which is capable of both dealing with an uncertain and turbulent future as well as creating the spatial flexibility to give stakeholders the power to intervene and steer towards a more resilient future in the area. The main question remains which intervention has the best results i.e. leads to higher resilience of the area. Although these innovations were developed during the planning process of the new regional plan for Groningen, the question is if and how the developed interventions will be realised. 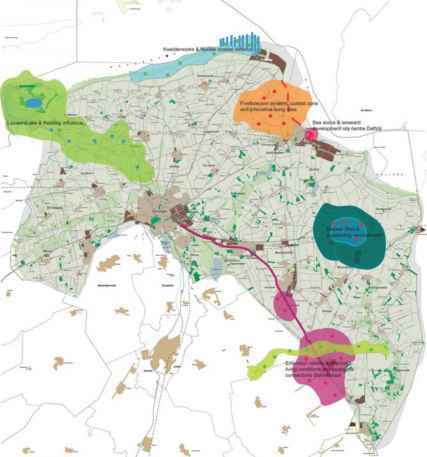 Despite the fact that decision makers decided to define four area assignments, where integrated area development should take place, and these areas are the same as the areas where interventions are proposed, it is still uncertain if these interventions will be part of the area development. This might lead to the conclusion that the thinking on improving resilience is not translated into political objectives yet. The existing planning process is still a tame process, where the problem analysis and the derived solutions are the objective instead of aiming to increase the adaptive capacity of spatial systems, enhancing an increased resilience. The question is if the sense of urgency to prepare for future turbulence is high enough among decision makers of today. The resilience of areas to deal with a turbulent future may be improved by applying the principles as defined in the theory of complex adaptive systems to spatial planning methods. 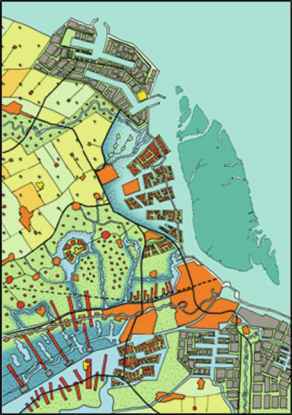 So far, there are not many examples of spatial planning, which use this theoretical background in planning practices. The Groningen case shows that a region can be made more resilient and better able to deal with turbulence when the principles of complexity and resilience are used. Usage of these principles may change the planning practice towards a more adaptive and flexible form of planning. And because every region will have to deal with more turbulent circumstances in the future it may be concluded that the first experience with this new planning paradigm (swarm planning) can be used in other regions as well. Societies are better prepared for a turbulent future if strategic interventions are included and in a spatial sense the space and conditions are created to adapt in planning system. If the space is created the capacity of stakeholders and citizens to contribute to the development of the spatial system in the area can be implemented more easily. When strategic interventions are combined with the spatial conditions to adapt to future threats and challenges and when the area is given the time and opportunity to get used to dealing with future threats and challenges, resilience is improved. When the interventions are well defined they are able to steer the swarm. Swarm planning is capable of starting adaptive processes, which makes it easier to adapt society to emerging turbulent circumstances. If a simple intervention has a wider spatial impact the measure is more powerful and potentially has a higher impact on resilience. When the possible effects of turbulent environments are included into the design and spatial layout of the area these future threats and challenges are no longer a surprise, but are rehearsed and have become familiar situations: the area has adapted before it is confronted with the changes. In Fig. 8.18 the mutual relations between all facets of the case are visualised. When large impact changes, like climate change, an Internet society or uncertain energy supply are, are about to happen, they imply an increasing turbulence. These developments influence the regional spatial system. In order to understand this regional system better, the principles and characteristics of complex adaptive systems can be of help as well as the regional mapping of climate and energy potentials. Lessons learned from adaptive systems, combined with the regional energy and climate characteristics, offer the opportunity to find the most suitable strategic interventions and localisation of flexible space. These two elements lead to increased resilience of the regional spatial system, if used in the right spatial planning system. The increase of resilience in the regional spatial system implies that the region will be better equipped to deal with the described turbulence. and the adaptation to climate change is not only necessary, but can only made possible if individuals and groups participate and contribute at a local level. The first experiences in Groningen show that it is possible to rewind and rethink the future. Local energy potentials and adaptation possibilities can be implemented in spatial developments, starting now. Developments can and will happen fast. Do you remember? Only ten years ago my e-mail exchange was dependant on a little house in a side street in Ushuaia, Patagonia.